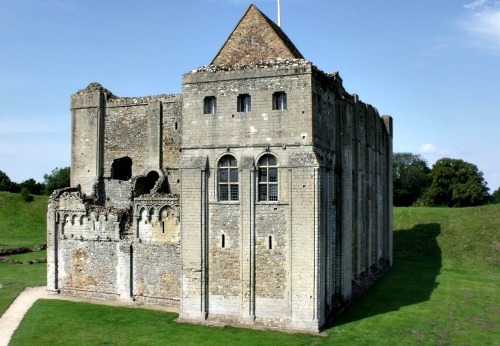 Construction on Castle Rising began in 1138 by William d'Aubigny II, Who became the Earl of Arundel after rising through the ranks of Anglo Saxon nobility. The castle was built to impress, and was intended to be used a hunting lodge as much as a fortified home since it had a sizable deer park attached to it. Its luxury attracted some famous names in English history, such as Queen Isabella who lived there from 1330 until her death. Since the castle was not located in somewhere of strategic importance it was not practical to spend the money to maintain it, and the castle was much more prized for its hunting grounds. Because of this it fell into disrepair during the 1700's and was completely derelict from the middle of the century, though a small effort was made to save it by adding new living and servant quarters. The castle is known to have spirits through out, with tales being told about how visitors have been touched by ghosts, especially the stroking of women's hair, and orbs are also common through out. The most active and well know ghost at the castle has to be that of Queen Isabella. The story goes that she had married King Edward II, and together they had a son, Edward III. However in 1327 Edward II was de-throned in favour of their son, Edward III. Not long after this Edward II was murdered and suspicions fell onto a man named Roger Mortimer, who was believed to have been Isabella's lover. The new king became paranoid of Mortimer's growing power and decided to have his men raid Mortimer's home in Nottingham. He was given a trial and found guilty for the murder of Edward II and hanged at the gallows in Tyburn. Since Isabella was the mother of the king her life was spared but Edward III ordered her to be confined to castle rising. Though she was given servants and well looked after she was ultimately alone and had no one to confide in or turn to. This took its toll on her and its said that in her later years she became insane and would start screaming and laughing randomly. It is this manic laughter that people have claimed to have witnessed within the area of the keep, especially from the living quarters were she would have spent the last of her life.